When I played ball as a kid, I worked my way through a lot of the positions. In the minor leagues (8 and 9 years old), I was a third baseman and a pitcher. I had a natural curve that the coach liked. I also had decent reaction time for the hot corner. Though, I was forgetful with the most important piece of equipment and was reminded once when a ball hit towards me bounced off a rock. Never forgot that plastic guard again. Moving up to the majors (10, 11 & 12), I was moved to center field. I was the only kid on the team with any decent speed or range. So I roamed the outfield catching what I could. Last game, and we were out of the hunt, so the coach just put us in positions we had never played before throughout the game. First inning, I started at 2nd. Looking back at the last game, and the first inning in particular, the couch should have played the lineup that way the whole year. First batter ripped a shot down third the the kids plopped on to smother, got to his feet and threw the runner out. Next batter looped one over the short stop that the left fielder snagged with a diving catch. Third batter hit a shot up the hole, to the right of 2nd, that I broke to, backhanded, put on the brakes and threw out the runner by a few steps. ESPN Top Ten plays in one inning. But I am getting away from my story. Pony league (13 & 14). I get drafted by the Cardinals and at the first team meeting the coach tells me I am moving to second. "Because of that great play in the last game last season", I ask? "No Jeff. You have no arm." 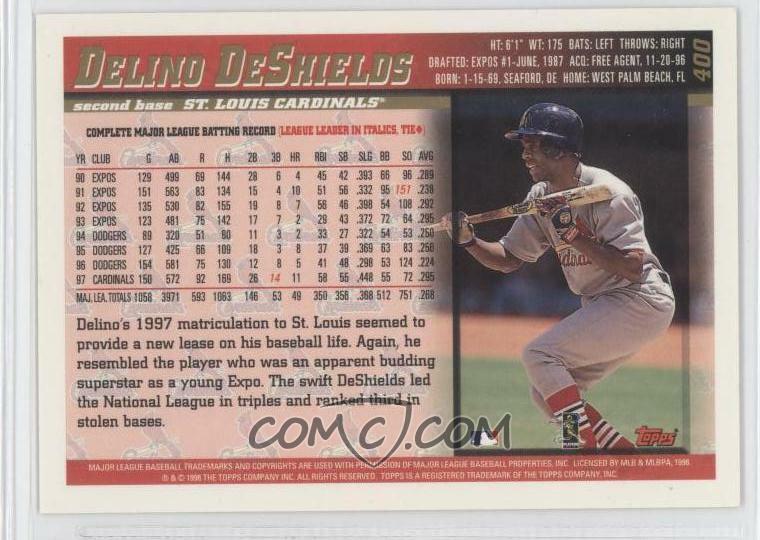 Ok, wasn't what you wanted to hear, but I became a two time All Star at second, committed just a single error in two years (because of an injured glove hand the previous inning sliding into a base) and batted .469 in my last year. In Colt....that's where I got stuck on the pines, and I figured the game wasn't fun anymore. So I moved to soccer. I was away from baseball a very long time. However, in my heart, I have always been a second baseman. It's natural one of my side collections in the play at 2nd. 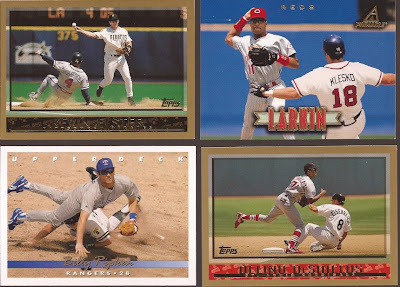 Jim over at Garvey, Cey, Russell, Lopes did an amazing double play card dump on his site, and it really impassioned me to work harder on that sub set. Jim and I talk about the DP cards that I find that are not on his master list. Recently, Jim dumped a nice envelope of ChiSox and double play cards to help me out. 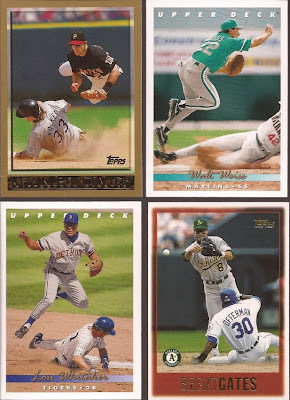 The Sox went to the Big Sort table (groan), but let's look at a few of the cards with the turn at two. Jim hit me with a couple dozen cards for the binder. I'm hoping Nacho has that Larkin, cuz he is not getting it. The star is the Delino in the lower right. Double play, killer stirrups and a bunt on the back. That's the trifecta here at the 2x3 household. I can honestly say I never had to sky over anyone trying to break up a double play in my youth career. Oh well, can't live the full life of a star ballplayer at 15. Thanks Jim. One day, we will have the definitive record of all the turns at second on cardboard. True story - the name of my blog was almost 'turning two'. Love the dp turn. That '93 UD Ripken is one of my favorite "turning two" cards. I believe it has a shot taken from the aftermath of the very same DP on the back. Does it keep you up at night worrying that some of your Turning Two cards actually feature a photo of a triple play? That's a whole nother can of worms right there.